And finally our last episode of "American Family Robinson - New Series". Program 143 continues the story as the Robinsons go on a trip to Hollywood. Mr. Robinson tries his hand at making hot dogs as Myra finds a woman who is contributing to War industry. The show was broadcast the week of June 1, 1941. This uncirculated episode of the series was digitized from an Orthacoustic vinyl transcription pressed by RCA, matrix number MS 065463. 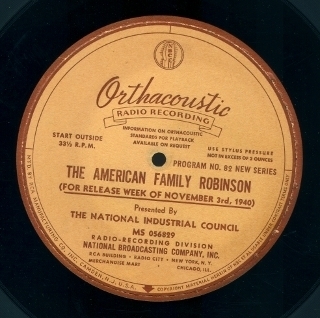 I'd like to offer my thanks again to the Old Time Radio Researchers Group that donated both the "American Family Robinson" and "New Series" discs to my collection a few months ago. Well, we're up to the last two shows I have in the serial "American Family Robinson - New Series", released by the National Association of Manufacturers to promote conservative political polices for businesses. This week I'm posting the last two shows together since they're a bit later in the series and in a different storyline that the episodes heard in weeks past. 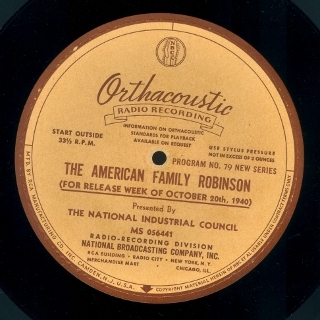 The first "Family Robinson" series in the 1930s was created to combat Roosevelt's New Deal policies. The "New Series" was written more to promote the idea that businesses could be on a war footing without any government intervention. These last two shows deal more directly with that theme, which was more obtuse in previous episodes. In program 142, Luke and Myra are on their way to Hollywood and Mr. Robinson talks with a salesman who is being "loaned" to work a lathe to help the War effort. This show was recorded for broadcast the week of June 1, 1941. Keep in mind that this was six months before Pearl Harbor - it really demonstrates how the war in Europe had everyone preparing for the worst and realizing we probably couldn't stay out of conflict. This previously lost episode of the series was transferred from original and Orthacoustic vinyl transcription pressed by RCA, matrix number MS 065462. 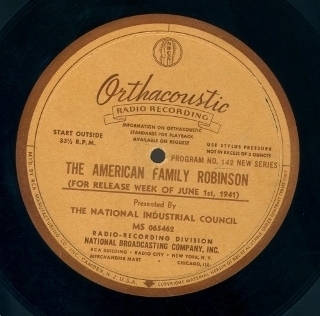 Only a couple more episodes to go in our look at the National Association of Manufacturer's serial "American Family Robinson-New Series", part of a propaganda campaign that included films, flyers and other materials to promote conservative political business policies. Program 83, released the week of November 3, 1940, has Luke finally heading home after hearing Myra's appeal on the radio. On the train, Luke talks with a passenger about how business are eager to help with preparing for War, even to the point of manufacturing airplanes before the government even asks for them. The show was digitized from an original Orthacoustic vinyl transcription pressed by RCA, matrix number MS 056830-1. 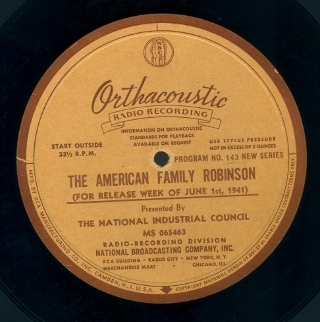 Only a few more shows left in our look at "American Family Robinson-New Series", syndicated by the National Association of Manufacturers to promote conservative political policies just before World War II. In program 82 released the week of November 3, 1940, Myra waits for a letter from Luke, hoping he has heard her appeal on the air as Agatha and Windy Bill shop for new items to sell in the store. The show was transferred from an original vinyl Orthacoustic transcription pressed by RCA, matrix number MS 056829-1. We're heading into the home stretch with our run of "American Family Robinson-New Series", our syndicated propaganda serial created by the National Association of Manufacturers. We've got five shows left to run on the blog in the series. Today, in program 81, we drop in on the Emporium. Luke and Myra are no longer the perfect couple and the customers are curious where Luke has gone. The show was released the week of October 27, 1940. Our story continues this week on "American Family Robinson - New Series", syndicated as part of a propaganda campaign by the National Manufacturer's Association against liberal polices that stifle business. Pgm 80, released the week of October 27, 1940, finds Luke still running away from home to escape the "perfect couple" publicity stunt cooked up by Windy Bill for the Emporium. He seems rather forelorn and homesick at the hotel, looking for something to do on a weekend night. The show includes a curious little conversation about Fifth Columnists and spies - Luke seems to think that those who stir up "class warfare" here in the States are doing the work of dictators like Hitler. The show was transferred from an original vinyl Orthacoustic transcription pressed by RCA, matrix number MS 056444-1. 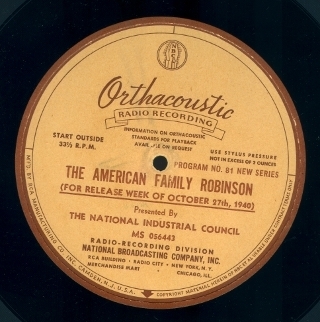 Things are heating up in "American Family Robinson - New Series", our syndicated propaganda serial from the National Manufacturers Association (aka the National Industrial Council). The Emporium's competitor, Gus Popelmeier, trying to expose the truth behind Luke and Myra's "Perfect Couple" publicity stunt, has found out that Luke has run away from home and is perfectly giddy about Luke and Myra's problems, planning his latest move. Meanwhile, Aunt Agatha and Windy Bill try to figure out what to do next. Of course, "American Family Robinson" wouldn't be complete without a dig a liberal policies. In this show, Aunt Agatha and Windy Bill's conversation turn to a thirty hour workweek, with Agatha noting that the French were taken over by the Nazis because of their shortened workweek. Strange that this series, designed to promote Conservative political views for business and manufacturing, depicts business people as some of the most sad, deceiving and crass folks on the planet. It makes for more fun and drama, but gives a very different picture of business owners than the original mid-30s effort heard a few months ago on the blog. 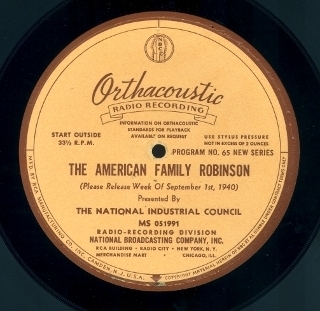 Program 79 in the series, recorded for release the week of October 20, 1940, was transferred from an original Orthacoustic vinyl transcription pressed by RCA, matrix number MS 056441-1A. Luke boards the train in Birch Falls on a little adventure in program 77 of "American Family Robinson-New Series", syndicated by the National Industrial Council (aka the National Association of Manufacturers). Luke tries to leave behind the turmoil in his marriage created by the "Perfect Couple" publicity gimmick thought up by Windy Bill. On the train, he quickly picks up a conversation with a traveling salesman, leading to a storyline that looks at what life is like for businessmen on the road. 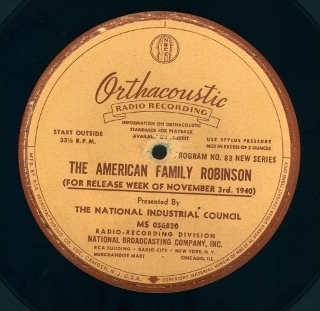 Program 77 was released for broadcast the week of October 13, 1940 and was transferred from an original Orthacoustic vinyl transcription pressed by RCA, matrix number MS 055677-1. The next show in the series, program 78, where Luke checks into a hotel, was previously posted in the blog a few months ago. We'll pick up with program 79 next week. 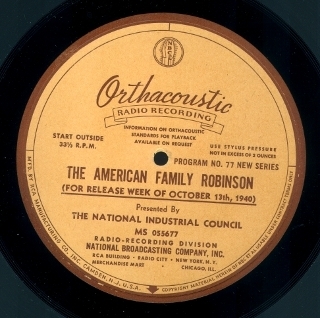 We skip ahead a few weeks in this week's look at "American Family Robinson-New Series", picking up the story with program 76 in the series for release the week of October 13, 1940. The owner of a rival department store has planted a dictaphone in the Robinson household, hoping to catch Luke and Myra arguing to expose their image of "the perfect couple" as a sham. As the show opens, Luke, in a conversation with Aunt Agatha, is bemoaning the fact that he's having to work so hard on this publicity stunt. Somehow, this turns into a conversation on how businesses, if they don't get the word out about how they're preparing for the possibility of war, might find themselves working for a dictatorial government. 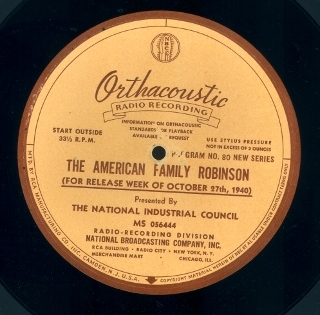 Now back to the continuing story of our politically conservative capitalist family in "American Family Robinson-New Series", a serial syndicated by the National Industrial Council (aka the National Association of Manufacturers). In program 65, for release the week of September 1, 1940, Luke, the Baron and Myra pack up and finally head for home after the camping trip. This someone how leads to a discussion about preparations for the war and accusations by pacifists that industry is war mongering.